Use these seven tips to improve your travel photography – and if you're under 25, enter the Young Photographer of the Year competition - your first entry is now free! Travel is one of the most popular subjects for all photographers. With new locations, and plenty of spare time, it is only natural that most of us take more pictures when we are on holiday than during the rest of the year, and we've made a special list of the best travel cameras to help you get those memorable images. But what makes a great travel picture? Here are seven pictures from the travel category of Digital Camera magazine’s 2018 Young Photographer of the Year and Photographer of the Year competitions that have caught our eye – and which are now contending for the £12,000 worth of prizes that are on offer. Each one provides a great tip or technique that you can use to help improve your own travel pictures. And now that you get your first entry free in the Young Photographer of the Year competition, there's no excuse not to enter. One way to help your pictures of well-known places look different from the next photographer is to look for what to put in the foreground of your shot. Don’t just concentrate on the thing in the distance you have come to see - hunt out an angle that gives you something different to put in the front of the frame. This way you can end up with a selection of shots of the location that all look significantly different. William Blatch used this technique well during a road trip around New Zealand. Paratahi Island is a natural focal point for shots taken on Karakare’s picturesque beach… but it is the driftwood on the foreshore that turn this into a beautiful, slow-shutter-speed composition, shot with his Olympus E-M5 Mark II. Sadly for photographers, the most photogenic travel locations are also the most popular. So to get a shot that is not full of fellow tourists, you need to plan your pictures with care – and be patient. It is worth trying to arrive at must-see locations early in the morning before the crowds arrive…. Or wait until late in the day until they return to their hotels. 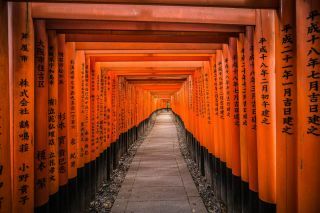 But think twice about cutting all signs of life out of your shots… This picture of the famous pathway to the Fushimi Inari Shinto temple in Kyoto, Japan looks, as first appearance, to be devoid of human life. But peer carefully at Marco Tagliarino’s picture, and you will see a single fellow traveller in the distance - which helps give a sense of scale to the red gates that line the path. A great trick for improving your view on things, is to hunt out an elevated view of your location. This literally gives you a different perspective on a site. It is a technique that has been used in this image taken by Alex Lobo on a trip to Peru. Seen from the neighbouring hillside, you see the scale and shape of the salt pans more clearly than you would do close up. Look for man-made structures, such as buildings, or natural ones, such as hills, that allow you to get your camera up high. Don’t forget, you can also get a new view on things by getting down low - lying down on the ground if necessary in search of an original viewpoint. If you are in a place for a short stay, it is not always easy to ensure you shoot it in the best light. However, it is always trying ensure you are in a decent spot to take pictures at sunset… and then hope you luck out with the light! If you spot a fantastic location at different time of day near where you are staying, it is always worth making a note to return their at the end of the day. This shipwreck in Cyprus makes a great focal point for a holiday seascape shot - but it is the sunset that has turn this into something special for photographer Elena Paraskeva. You travel not only to see the sights, but also to meet new people and experience new cultures. Make sure that you photograph the locals and their customs in your pictures, to ensure you come back with varied views of your vacation. A trip to China is not complete for the photographer without a visit to the incredible mountain peaks of the Guangxi province – but as this excellent portrait by Rob Howarth shows, it is the local cormorant fishermen that turn out to be the main attraction. With travel photography, you need a bit of luck to be in the right place at the right time. But there are always ways in which to stack the odds in your favour! A trip to Iceland doesn't guarantee you seeing the Northern Lights - but if you do chance to see this spectacular natural light show, it pays to be in a place that gives you an interesting view of the show. For Tom de Waart, this American DC3 plane was the perfect place to head for on the hunt for the aurora – and on this occasion he was richly rewarded for his efforts. It's easy for keen photographers to get so absorbed in shooting the new things they see when on vacation - and forget their travelling companions. But you can include them into your holiday album without having to resort to pedestrian snapshots or sickly selfies. This simple shot taken by Alan Godfrey on his Apple iPhone 5s not only depicts a great early years’ experience for a young traveller - but also goes to show that with holidays, the journey can be just as much an adventure as the destination. The winner of the open travel category will win a copy of Affinity Photo photo-editing software, an Affinity Photo Workbook, and a Fujifilm Instax SQ10 hybrid film-digital camera. Whlle the overall Digital Camera Photographer of the Year, sponsored by Affinity Photo, will win an amazing bundle of prizes worth £4800, including a Fujifilm XT-2 professional camera, two Fujifilm lenses, and an iPad Pro. The winning entries will be displayed in a special exhibition at The Photography Show at The NEC in Birmingham from March 17-20, 2018. Entries are also currently open in the wildlife, macro and monochrome photography categories. Other categories which open in the following weeks include portraits, landscapes, street photography, and a special category for shots taken on a smartphone.